The CNMI Men’s National Team drew first blood in its game against Guam in the EAFF Asian Cup 2013 Preliminary Competition Round 1 before losing to the host team, 1-3, yesterday afternoon at the Leo Palace Resort in Yona, Guam. Joe Miller gave the CNMI its first goal in the preliminary round of the EAFF qualifier. However, a penalty kick from Jason Cunliffe off William Dunn’s foul allowed Guam to tie the game. Dunn committed another foul and Guam connected on the free kick, while the host got its third goal off a handball from Kirk Schuler. 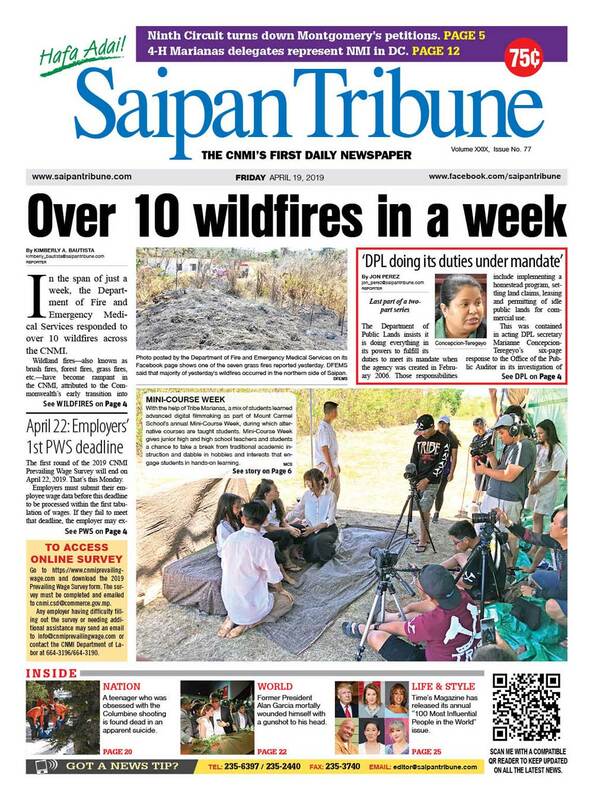 Other details of the CNMI-Guam match will be reported in Saipan Tribune’s Friday edition. Miller, Schuler, and Dunn started out for the visitors, joining goalie Daniel Stafford, Eric Cooke, Dan Westphal, Nick Swaim, Lucas Knecht, Bo Barry, Peter Loken, and captain Steve McKagan. Enrico Del Rosario, Kenneth Domingo, and Ruselle and Raphael Zapanta, and Brian Lee were the substitutes. The CNMI male strikers will have their second and final game tomorrow against Macau. The top finisher in the three-team tournament will advance to the second round in Hong Kong. Meanwhile, in the women’s division, Guam tricked the CNMI’s defense with quick passing to its forwards to cruise to a 6-0 victory Tuesday, according to a press release from Guam Football Association. The host scored all five goals in the first half before the Commonwealth tightened up its defense in the second half and gave only one goal. Arisa Recella put Guam in the scoreboard after converting off a Paire Surber pass from the center. A few minutes later, it was Surber’s turn to score after receiving a high cross from Tanya Blas-Cruz. Suber continued to hurt the CNMI and logged back-to-back goals in the first half, making a free kick, which rolled to the right post out of the hands of Commonwealth goalie Jhaneeka Atalig. The Guam forward was not done yet in the first half, as she posted one more goal for a hat-trick, while Andrea Odell drilled the host’s last goal in the opening 45 minutes of the match, hitting a header off a cross from Meagan Speck. Down 0-5, the CNMI made necessary adjustments on defense and almost shut out Guam in the second half before co-captan Simie Willter hit a long-range shot that went into the goal behind Atalig. Meanwhile, the CNMI Women’s Nationals will play Hong Kong today at 4pm.